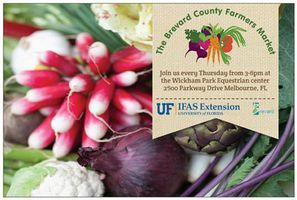 Join us every Thursday from 3pm to 6pm at our usual location in the Wickham Park Equestrian Center! We are back home in our pre-Irma quarters at the Equestrian center! The Brevard County Farmers Market was created in 2009 to provide a direct-marketing outlet for local growers and producers, and to provide consumers in our community with the opportunity to purchase the best Brevard county has to offer!